Property 2: Luxurious penthouse with fantastic view of the lake. 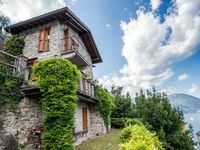 Property 8: Summer Cristina comfortable property near Lake Lugano. Property 27: Authentic Italian family house. Private garden and roof terrace, view of Como lake. This property is absolutely charming with amazing views!! My wife and I stayed here for three days. This was our first visit to Italy and Brienno, Como was not disappointing! Beautiful views and friendly neighbors and villages. Both Carmen and Lilia were very well coming and responsive. We would and will highly recommend this property. Hope to return soon!! We had a perfect two weeks in the house, with owners being very helpful. You cant desire more from a vacation house - perfect view, perfect location! Thanks for having us, hope we'll come back some day.